“Canada has the most successful set of immigration policies in the world, tweeted Fareed Zakaria to promote his recently aired CNN special on immigration, which also served as a basis for his column in Time Magazine. Zakaria holds up “Canada as the one nation getting immigration right.” Gushing with enthusiasm, he offers the Canadian system of immigration as a model for the United States. Really? Speaking as an economist who has studied Canadian Immigration, all I can say is I wish it were true. Zakaria’s deft mastery of the medium of television allows him to paint a glowing picture of the Canadian immigration system. Exactly where he gets his information though is difficult to verify because, unlike an academic paper, TV programs don’t have references or footnotes. The main Canadian interviewed is Naheed Nenshi, Canada’s first “Muslim cowboy-hat wearing mayor,” who makes for lively TV and is quite willing to rave on about Canadian immigration policy, even though he is no expert on immigration. Zakaria also talks to Robert Guest, The Economist’s business editor who speaks glowingly of Canada, but again is not a Canadian immigration expert. Zakaria illustrates the success of Canada’s policies of multi-culturalism and diversity with a reference to the CBC program “Little Mosque on the Prairies,” which allows Canadians to laugh together at the imagined experiences of Muslim immigrants in a small prairie town inhabited by rubes. Overlooked are the very serious tensions that have arisen from terrorism incidents such as the Toronto 18 bomb plot, the Khadr families exploits with Al Queda in Afghanistan, or Momin Khawaja’s conviction for conspiracy to blow up civilian targets in London. Contrary to the impression created by Zakaria, not everybody in Canada is as wildly enthusiastic as Nenshi about immigration and multi-culturalism. An August 2011 survey by Ipsos/Global @dvisor done in 23 countries revealed that 42 per cent of Canadians agreed that “There are too many immigrants,” 56 per cent agreed that “Immigrants put too much pressure on public services such as health, transport and education services,” and 41 per cent agreed that “Immigrants in Canada have made it more difficult for Canadians to get jobs.” This is not so different from American views on immigration. What are the real facts about the performance of Canada’s immigration system? While it used to be very successful and deserved to be celebrated around the world, it has long been coming unglued. This has been evidenced by a steady deterioration in the performance of recent immigrants in the labour market and a growing fiscal cost of providing government goods and services to immigrants. From 1980 to 2005 the median earnings of recent immigrants in constant dollars dropped both in absolute amount and proportionately, tumbling to around 50 or 60 per cent of the earnings of Canadian born (Table 1). Immigrants were not getting the high-paying jobs that could be expected based on their educational qualifications. A common stereotype often invoked was of immigrant doctors and engineers driving cabs. And while data on earnings from the 2011 are not yet available (and may not be comparable when they are, given that the long form census that collected this information was scrapped), this deterioration probably continued since the 2005 census year. 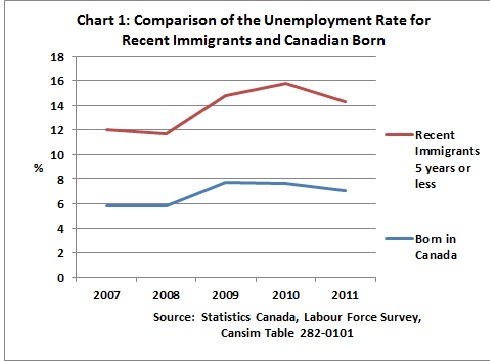 The unemployment of recent immigrants rose sharply following the 2008 financial crisis and in 2011 the unemployment rate of recent immigrants was still more than twice that of the Canadian born (Chart 1). Note: 'Recent immigrants' are those who arrived during the five-year period ending one year before the census year. They do not include those who arrived in the census year because many of these would not have had the opportunity to work for a full year. Source: Statistics Canada (2008). Earnings and Incomes of Canadians over the Past Quarter Century, 2006 Census. Catalogue no 97-563-x, p.22. There are even grounds for doubt that the children of immigrants will achieve the success that has eluded their parents. Data from the 2006 census show that second generation visible minority immigrants only earned 66 per cent of non-visible minorities and female immigrants 83 per cent. Since 1991, visible minorities have made up almost three-quarters of immigrants. Americans won’t be surprised to hear that the poor performance of visible minority immigrants and their offspring has led governments to implement affirmative action programs and that there are pressures for even more. As visible minorities become a progressively larger proportion of the population, it will, of course, become more difficult to make affirmative action work, if it ever has, and it will cause increasing resentment and social tensions. The Conservative Canadian Government, which has been in power since 2006, has recognized the growing problem of the deteriorating performance of new immigrants. A symptom was the growth in the backlog of applicants to over 1 million or more than four times the annual inflow and the increase in the wait time for skilled immigrants to over 8 years, which threatened to exacerbate the deterioration by bringing in immigrants who had been allowed to languish too long in the queue. Because of the government’s minority status, it had to address the problem gingerly through exercising its administrative authority to prioritize applications and put more emphasis on occupations in demand. It wasn’t until after it won a parliamentary majority in May 2011 that it was able to introduce legislation in the 2012 budget eliminating the skilled worker backlog and giving the Minister more authority to issue regulations. Zakaria’s claim that “Canadian immigration policy is now centered on recruiting talented immigrants with abilities the country needs… they don’t even need to have an employer” is no longer strictly true following the Government’s recent policy initiatives. Indeed it was the former policy described by Zakaria that had produced the deterioration in the performance of immigrants that prompted the government to take action. It’s not so easy to assess the educational and job skills of immigrants who mainly come from developing countries. That’s why Canadian employers completely discount job experience acquired in foreign countries (except perhaps for the U.S. and Western Europe). And it is true that the education they receive back home is not equivalent in quality to that received in North America or Europe. As part of the reforms introduced in the recent budget, the Government will be putting even more weight on prearranged employment as a criterion for entry. And to get around the inflexibility of the immigration system, it has been bringing in unprecedented number of temporary foreign workers even for jobs that require high levels of education and skills. Another thing that Zakaria doesn’t understand about Canadian immigration is how the selection system works for skilled workers. While he is partly right that the proportion of immigrants based on the skills of the principal applicant is around 62 per cent, he neglects to say that this includes business immigrants, immigrants selected by the provinces under provincial immigration programs (many of whom are unskilled), as well as all the spouses and underage dependents of the principal applicants who are not necessarily either skilled or educated. The actual share of principal applicants who are assessed based on objective criteria is less than a fifth. A corollary to this is that an even smaller share of US immigrants is assessed based on skills than the 13 per cent cited by Zakaria. When only such a small proportion of immigrants is actually selected based on their skills, it is unrealistic to expect that this selection process will have a large effect on the overall performance of immigrants. Zakaria makes much of the loss of foreign graduates of U.S. universities to Canada. In support, he cites the particular example of Microsoft, which has established a research facility in Richmond British Columbia only a short drive from headquarters in Redmond, Washington. This sounds worrisome on television. But a closer look reveals that this facility only employed around 365 people in 2008, which is but a small fraction on Microsoft’s total worldwide employment of over 91,000 in that same year. And total Microsoft Canada employment in 2007 was only estimated to be 844. It’s hard to see how the U.S. is losing out much to Canada on the loss of such a small number or skilled workers even if they are all really lost. In fact, the distribution looks more like Canada having its traditional 10 per cent share of all things American. 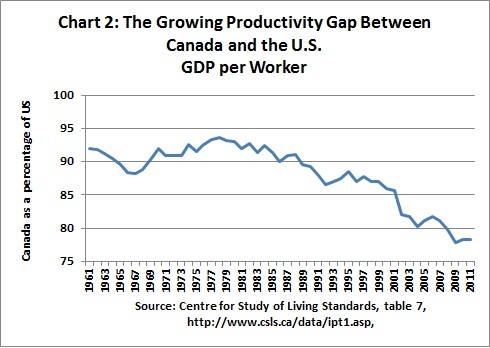 If the United States is really losing out to Canada because of better immigration policies being pursued in Canada, how does Zakaria explain the large drop in Canada’s productivity relative to the United States over the last quarter century (Chart 2)? Either Canada’s immigration policy isn’t all so successful or immigration policy doesn’t matter very much for productivity and growth in living standards. In either case, Canada might not be the great model for American immigration policy proposed by Zakaria. There is no doubt a lot wrong with the U.S. immigration system that needs to be fixed. But solutions need to be based on hard facts. And this excludes most of what Zakaria presents in his cursory, but colourful, examination of the Canadian immigration system.